To turn any pair of glasses into prescription sunglasses simply click 'buy now' on your favourite frames and add a tint when you personalise your glasses or from the shopping basket. 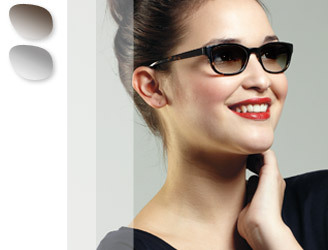 And remember that with our 2 for 1 you get a free second pair when you select frames £49+, Boutique excluded. Add £10 dark tints to your free second pair and turn it into a pair of prescription sunglasses, for just £10. All of our tint options are listed below. Make any of your favourite frames into sunglasses with dark tints, available in brown, green and grey. Brown tints go well with golden, tortoiseshell and pastel coloured frames, and grey tints go well with silver/gunmetal frames, bright plastics and black frames. Polarised lenses offer both a stylish look and protection from harmful rays by filtering out reflected glare. These lenses are available in brown and grey. These popular lenses feature a fading tint, and are dark at the top fading to a lighter shade at the bottom. Graduated tints are ideal for driving as the bottom of the lens is lighter which makes it easier to see controls within the car. Graduated tints are also very fashionable, and look great when combined with oversized or aviator style frames like the Cowboy. Transitions® Adaptive Lenses are satisfying millions of spectacle wearers worldwide. With the widest variety of lens designs and materials to choose from, Transitions® Adaptive lenses offer a distinct advantage over ordinary clear lenses.